The CMI (Carmelites of Mary Immaculate) Congregation, founded by Blessed Kuriakose Elias Chavara in 1831 has the rich tradition and century long experience in the field of education with its numerous schools, colleges and other professional educational institutions. Santhigiri is the verbalization of this CMI charisma. Santhigiri is a vision of the Carmelites of Mary Immaculate (CMI Fathers) of Carmel Province, Muvattupuzha, Kerala. 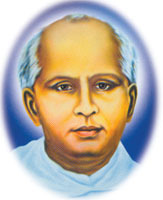 Rooted in the rich cultural heritage of our Motherland, drawing inspiration from Blessed Kuriakose Elias Chavara and abiding in the grace of our Lord Jesus Christ, this CMI educational institution concentrates on the overall formation and progressive growth of each person, to take up the challenges of tomorrow and to become contributing members of the society.